The ‘1659 Census’ is one of the most comprehensive and accessible of the ‘survey’ documents that have come down to us from the mid-seventeenth century. Yet the ‘Census’ has received little scholarly analysis. 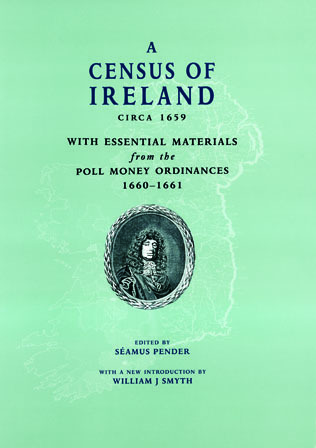 In this volume Séamus Pender’s 1939 edition of the ‘1659 Census’ is reproduced with a detailed new introduction by William J. Smyth. What Professor Smyth succeeds in demonstrating is that the ‘Census’ is a better, more consistent and much more important source of information than has been allowed for in the existing literature. He also locates the ‘Census’ in the context of William Petty’s overall objectives in the 1660s, and by way of a series of island-wide maps, reveals the relevance of the ‘Census’ to ongoing research on seventeenth century Ireland.